Clear Spider is a highly flexible system that can integrate with any software on the cloud. Don’t see what you are looking for? Talk to us about more integration options. Contact us here. We use web services to automatically pass files between Clear Spider and other applications. The web services framework allows the interchange of data in formats such as XML and tabs-delimited. This is done through a request and response from each software application respectively. The request includes a directory of what data points are needed so that the response transfers all the necessary information. 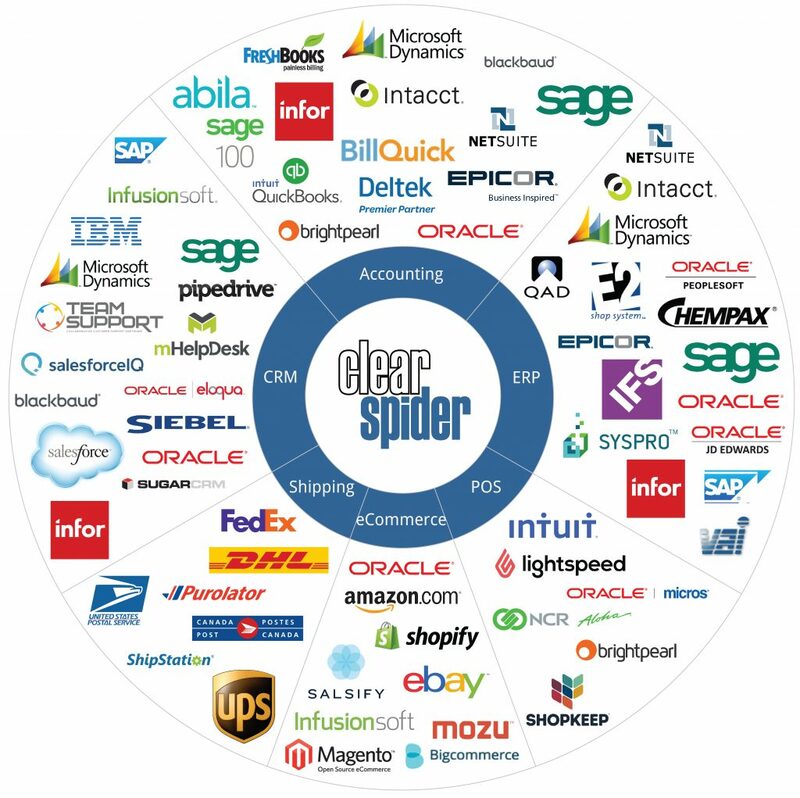 At Clear Spider, we currently have over 35 web services in place for integration purposes. These frameworks enable us to securely move files between applications in real-time or in scheduled batches. Give your customers and partners limited access to your inventory system so they can view or edit items. This makes collaboration simple and straightforward for any system setup. Increase visibility by storing all inventory information in one place. Streamline the data flow between Clear Spider and other software systems. Have full inventory visibility at all times. Manually transferring data between systems can increase the risk of bad data being entered. Seamless integration eliminates human error by automatically transferring files between systems. Most standard inventory systems are not customizable and do not effectively optimize your inventory management. Our team will customize your inventory system to match your workflow, integrate with current and future software applications, and include all the functions your organization needs. Save time and money by eliminating the need to manually transfer data between your software systems. Clear Spider integrations let you put those efforts back into value-adding activities for your organization. Remove the complexity of managing data and integrations across multiple systems. Always have the most current data no matter who is updating the system and where it is being done.